continue on to San Simeon, where will lodge for the next two nights. Day 2 Breakfast this morning. Today we spend some time exploring the northern coast of California. As we travel along the coast, we will see the rich vegetative hills meet the sea with scenic grandeur, allowing us to admire its natural beauty. We will make a stop at the Friends of the Elephant Seals at Piedras Blancas. It is a truly amazing sight to see hundreds of seals and their babies on the beach. We will spend time in the unique town of Cambria where you will enjoy the festive ambiance as the village celebrates. 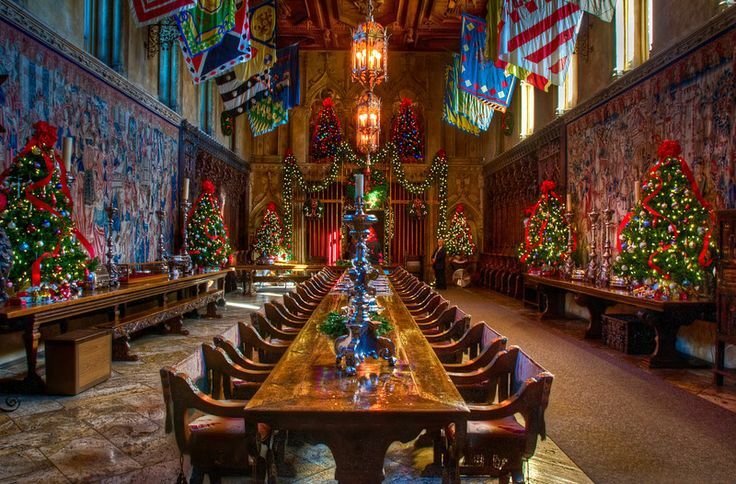 CHRISTMAS AT HEARST CASTLE was one of William Randolph Hearst’s favorite holidays. This enchanted evening tour will show you the setting by which Hearst entertained his guests: on a grand scale. You will be shown the castle’s Assembly Room, the Refectory, and the Morning Room. Each room will contain lavish decorations of hand-made garlands, brilliant red poinsettias, and two 18-foot, fully decorated, Christmas trees with lights and traditional ornaments. Day 3 Breakfast. We leave San Simeon and travel south until we arrive in Solvang. This is “The Danish Capital of America” and the town is decorated for their Winterfest Celebration. You will have some time to shop and have lunch on your own. We continue on to Ventura where will we stop for a break before heading home. With all the sights and sounds of this tour, you will surely have the Spirit of Christmas in your heart.